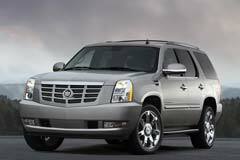 The Cadillac Escalade is for buyers who like their autos brash, large and authentically American. The 2007 model presented the debut of the awaited third-generation that depicted modernity in a luxurious and classy fashion. Unlike previous models, the newer generations have a front coil-spring that gives the ride a smoother feel. This, coupled with the standard 6.2L V8 engine that creates 403 horsepower and 415 pound feet of torque, makes the driving experience exceptional. The 2009 model set the tone for high-tech features like LED headlights, rear-view camera, blind-spot warning system, Bluetooth and an E85 fuel capability. Following this, the 2010 make saw an introductory cylinder-deactivation tech, front-side impact airbags, USB connectivity and strengthened doors. However, the first and second generation used Cadillac Escalade cannot be overlooked; they are the generation that transformed Cadillac’s image to a more youthful and serious look. The second generation boasted a 6L V8 engine with 345 horsepower capability. They handled the road surprisingly better than you would expect. 2009 Cadillac Escalade ROOF,NAV,REAR DVD,HTD/COOL LTH,CHROME 22'S,83K 2009 Black ROOF,NAV,REAR DVD,HTD/COOL LTH,CHROME 22'S,83K!